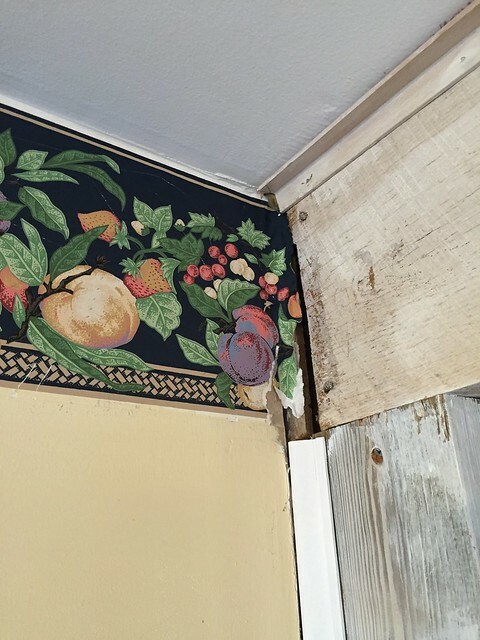 Since we bought our Foursquare back in October 2014, we've been working to rid our home of outdated wallpaper. 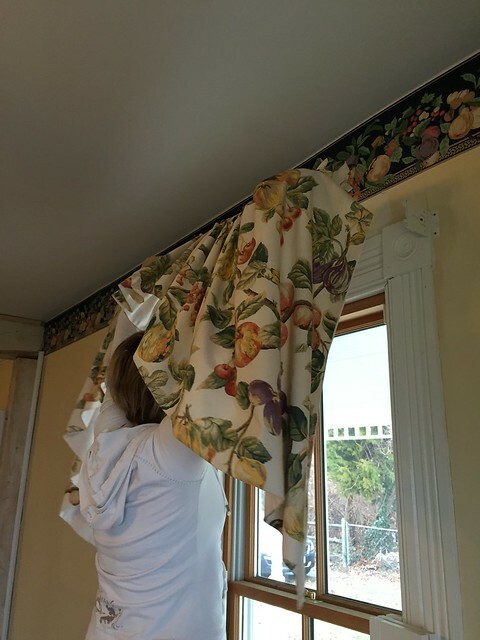 In fact, the very first project that we started just a mere hours after closing on our home was when my mom and I launched into removing the floral on floral on floral wallpaper and curtain theme of our first floor bathroom. The end result of our efforts on this small bathroom gave us a glimpse of what the rest of our home could eventually be, and it all started with wallpaper removal. Oddly, this wasn't the first time my mom has taken to removing floral wallpaper from a room, but in the past it was actually in the home I grew up in. Looking back on growing up as a child of the 80s and 90s, my mom successfully embraced many of the "on trend" styles of the time. 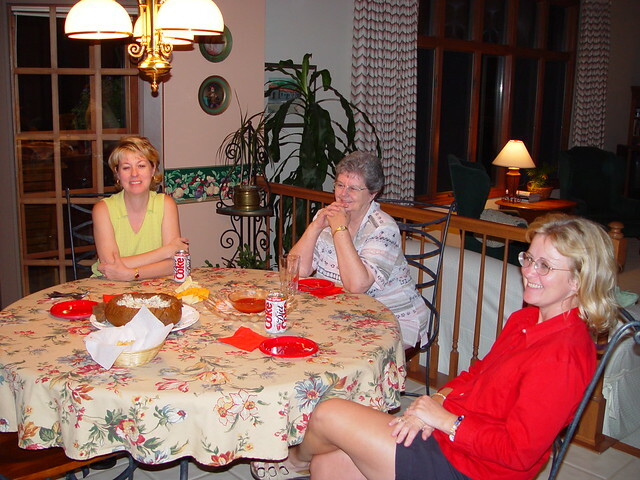 And when my parents built their current home in 1990, my mom enjoyed decorating their new home. Her overall color scheme was sea foam green and peach, which ran through the house in various formats including wall-to-wall carpeting, wallpaper, and more. She then branched off of these base shades and incorporated a few sponge painted walls in salmon, added hunter green window treatments and accents pieces, as well as furniture in complementary hues. 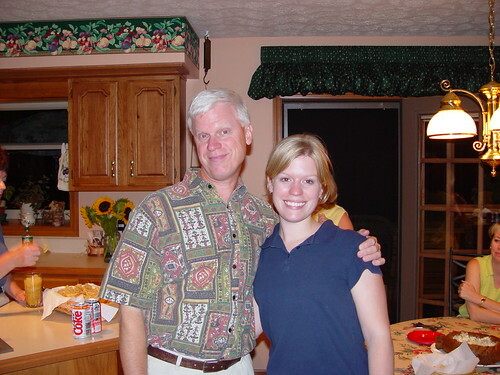 But one item in particular stands out to me as her statement piece at the time, which was a fruit and floral wallpaper border that adorned our kitchen walls. Who knows, you may have also crossed paths with this border, or a similar one, as well. Initially my mom painted the kitchen in a color my dad lovingly dubbed "Pepto Bismol pink," a bold shade that was pulled directly from the border itself. Realizing pretty early on that it was a bit more of a statement than she intended to make, she later toned the paint down to be more of a peachy hue (seen in the photos above and below) which was repeated in the flame patterned curtains in the adjoining family room. 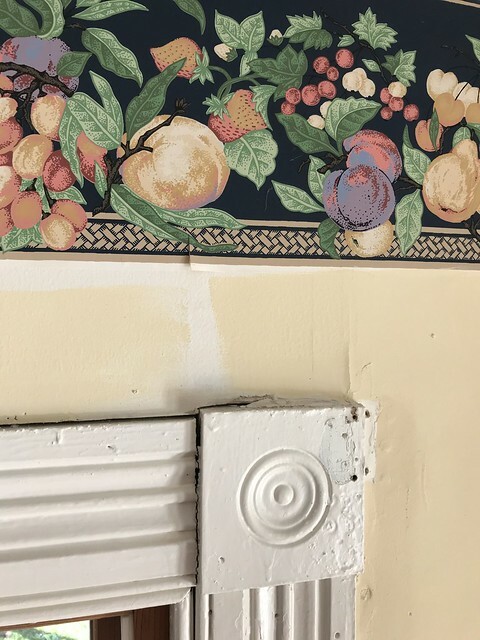 After the trend of large contrasting print borders came and went, in the early 2000s my parents decided to update their kitchen and removed their wallpaper border (along with switching out appliances, cabinet hardware, and counters). With it, a small piece of my childhood went too, but I was okay with it. The wallpaper border had run its course, and it was time to move on. Fast forward many years to mid 2014 when we first toured our Foursquare. 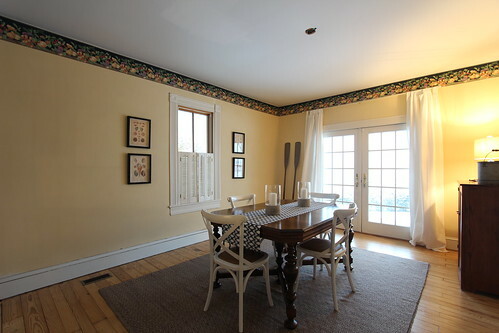 Well before we knew it would be the house we would ultimately purchase and therefore be our next major project (okay, maybe Alex had his mind made up well before I did), one of the things that immediately struck me on that first visit was the familiar wallpaper border in the dining room. I immediately recognized it as the very same wallpaper border that adorned my parents' kitchen walls so many years ago. Here's a look at our dining room on the day we closed on the house. Of all of the wallpaper borders in all of the old houses in the world, what are the odds that I would walk into and buy a house with the exact same border as the one from my childhood? 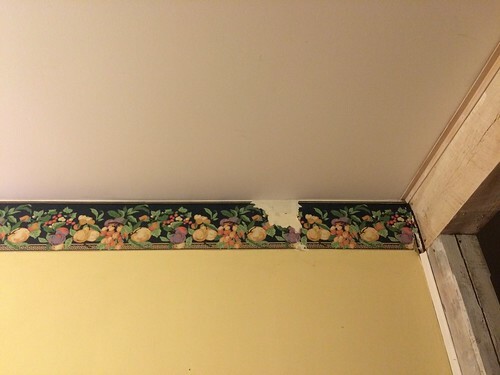 As I mentioned, this wallpaper border was perfectly stylish and on trend in the early 1990s, but now it's bordering on retro. (Sorry, I couldn't resist.) And as much as it's giving me wonderful feelings of nostalgia for New Kids on the Block and Milli Vanilli, it just doesn't work in our 1908 farmhouse. I've been itching to remove it since day one, the same day I vowed to remove the complementary fruit patterned window treatment! 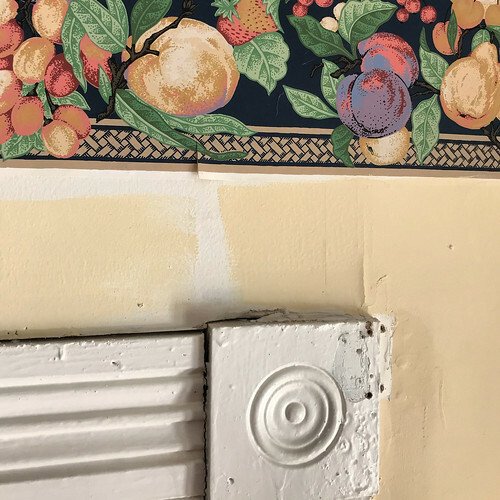 Knowing our dining room renovation was likely years away, I tried to rid us of this of our produce inspired wallpaper embellishment with a little wallpaper stripper and good old elbow grease. I figured it would be a good way to tide me over until we reached demo day. Sadly, the border had other ideas and I failed miserably, removing just a small portion before throwing in the towel. As soon as I started to remove it I started tearing into the drywall paper. I also noticed the prior paint job had not been applied under the border, but actually overlapped the bottom of it every so slightly. So if I had been successful a ghost of the border would have still existed. I was going nowhere fast and begrudgingly, the border was allowed to remain. Nearly to this day I've stared at this border every time we're in the house, along with the blue drip residue from my ill fated wallpaper stripping attempt, and I shudder in disgust at my failure. In this time we've done our best to look beyond and use this room until we started to renovate. This room, complete with a random patched and painted spot on the ceiling, an off center chandelier electrical box (that actually supported a ceiling fan -- we're still not sure how it stayed up there), patched walls, sloppy paint job, insufficient lighting, a hole in the ceiling, and of course, the fruit and floral border of my youth, has been begging to be turned into the dining room of our farmhouse dreams. It may not look so bad in the photos using a wide angle lens, but here's a look at what the room looks like when you're up close and personal. 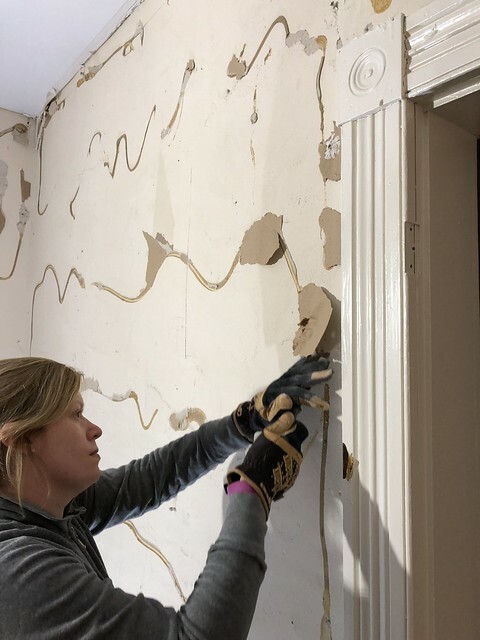 The drywall has gaps all over the place, there's missing and lumpy paint, the border is peeling, the moulding is full of holes, and the drywall over plaster makes us lose so much depth on our original moulding and rosettes. It's an old house tragedy. Today, I'm proud to tell you, this room's transformation has begun! 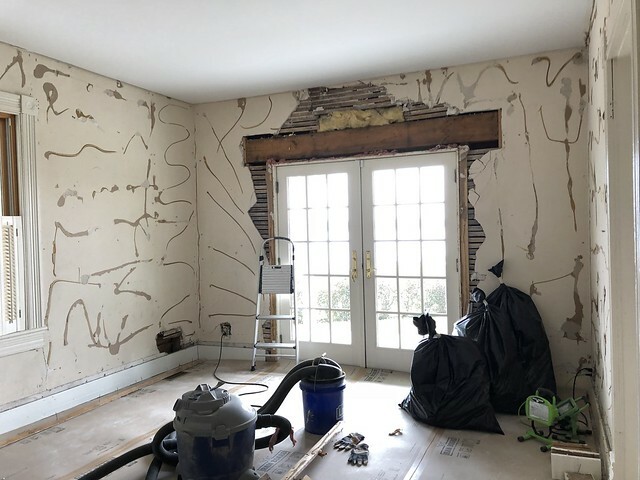 Yes, we've officially started the renovation of our dining room, and it was actually a few months earlier than I thought it was going to be! 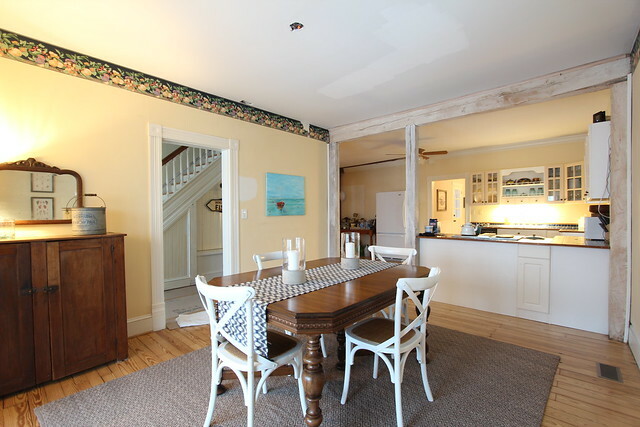 Initially we thought we would begin the dining room after we finished up the hallway. But when we got into the hallway we realized we'd need to take care of a few things in the dining room in the way of electrical work before moving forward on the hallway. Here's a little video that shows the work we've been up to. Similar to our living room, in the early 1990s someone opted to cover the original plaster in the room by applying a liberal amount of Liquid Nails and hastily screwing a bunch of sheets of drywall up to mask the rough and cracked plaster. But after seeing the damage we did to the finish of our floors in the living room by removing the drywall (before our floors were refinished), we knew we wanted to protect our refinished floors from corner to corner. We did this by putting down a layer of RamBoard. While the living room took us significantly longer than we'd hoped (ahem, two years...), we learned quite a bit from our process and hope it speeds our project here in the dining room. We've also added a few tools to our arsenal to help the process move at a better clip. Most notably, one of Alex's favorite new tools, the Makita cordless cut-out saw . 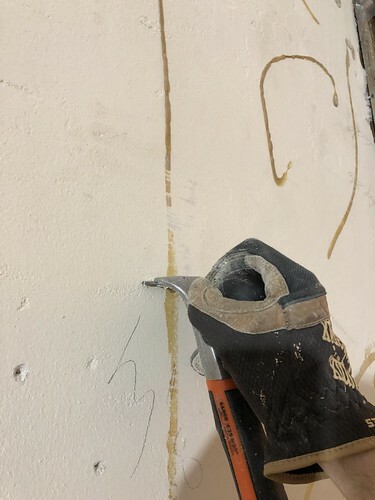 He's planning a blog post for this tool but I have to tell you, it's a bit of a game changer for us when it comes to easier drywall removal without damaging the plaster beneath, as well as cutting plaster only where necessary. Alex and I worked our way around the room, removing the drywall and inspecting the plaster as we went. What we found was not a surprise. The wall was covered haphazardly with liquid nails and the sheetrock was just pushed and screwed in place with drywall screws. Removing the drywall from the plaster took us about two days and left us with a good sense of the condition of our plaster walls. 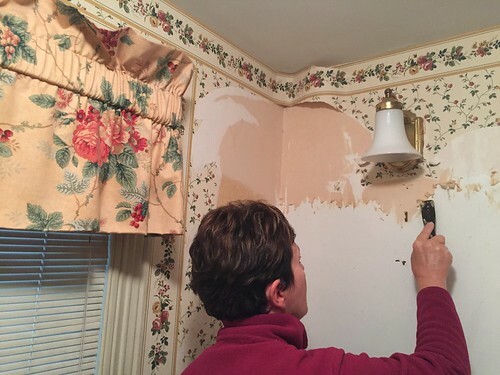 There were fewer holes and cracks than we expected, and thankfully no wallpaper covering these walls. We also removed the base cap moulding, as well as some plywood nailed over original baseboards in an attempt to make the baseboard thicker so the drywall over the plaster wouldn't look quite so bad. Since we're putting everything back to the way it was supposed to be, we're getting rid of this unnecessary plywood. 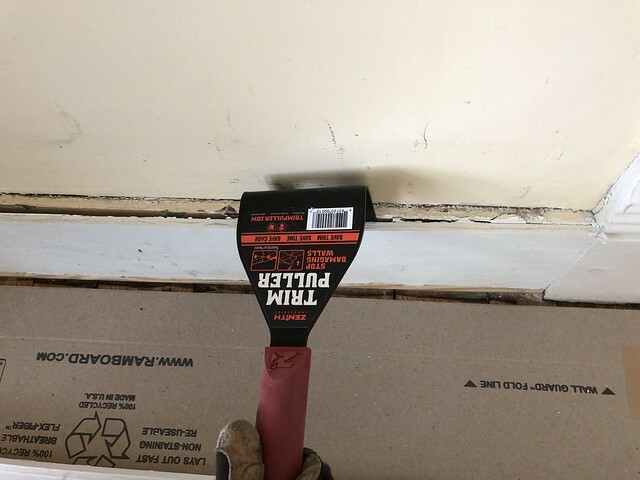 The Trim Puller is another tool that is a "must have" for people working on old houses. We've yet to find a method for saving old moulding with minimal damage that works better than this tool. You still need to be careful when pushing hard against plaster, but it's so much more forgiving than a traditional pry bar. When it came down to it, one of the most tedious parts of the demo project was the removal of the liquid nail streaks all over the walls. 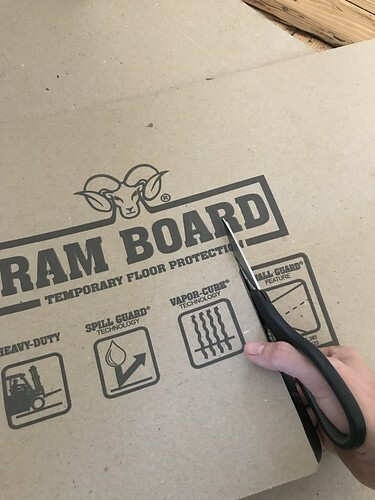 In most cases they can just be scraped off with a putty knife or five-in-one tool. Every streak of the lumpy brown mastic made us hate the person that applied it with every stroke of the scraper. 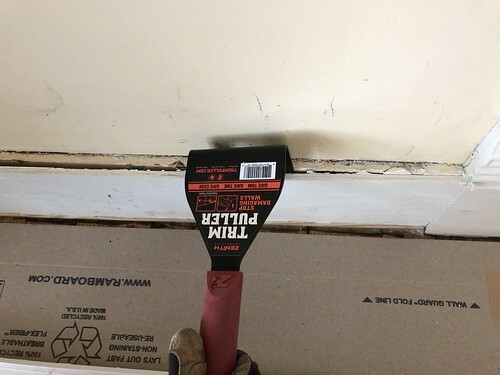 When it was particularly difficult to remove any of this hated product we also found that our Bahco Scraper was able to get the goo completely flat. With the drywall and moulding down, we're ready to continue on with this room's renovation. 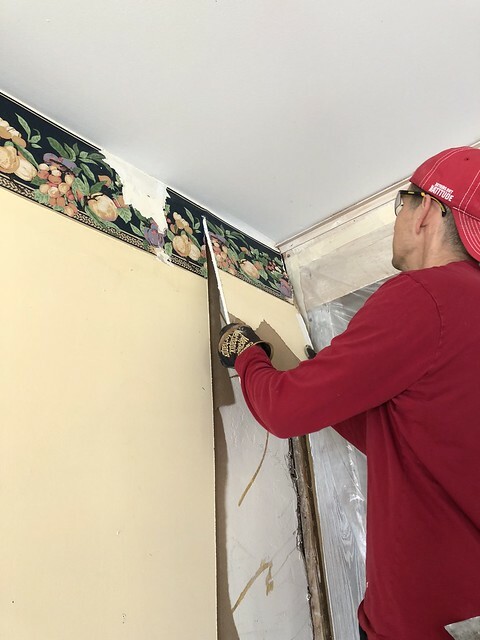 In addition to restoring the original plaster, we'll be adding recessed lighting, a new chandelier, and two part crown moulding, as well as repairing/replacing damaged sections of the original baseboard and window mouldings. In the grand scheme of our restoration, it will be a relatively "easy" room to tackle, and we hope to have it done well before springtime. As is tradition, we enjoy open ended deadlines that sound finite, mostly by claiming a conclusion by a point in time that repeats annually. But I do think...hope...anticipate that it will be this coming springtime. 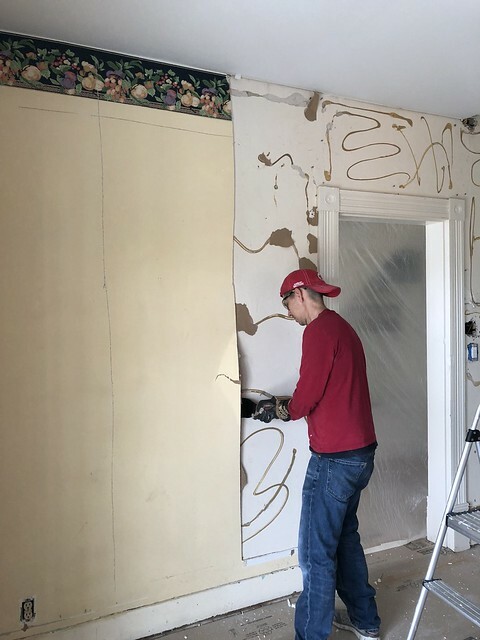 We'll be keeping you posted on our efforts, but for now, we're thrilled that a major milestone has been reached in that our home is now officially devoid of decades-past wallpaper. Your plan for this room sounds like it will be beautiful. 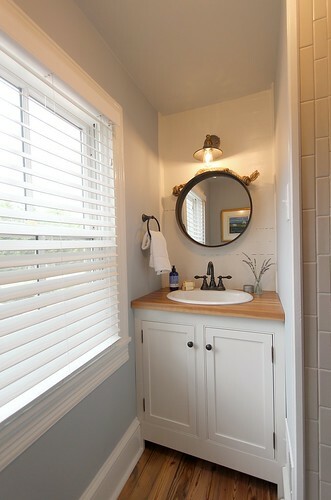 I'm interested in learning how you plan for and install the recessed lighting. And I love watching you do the plaster restoration work too. You two are truly amazing! 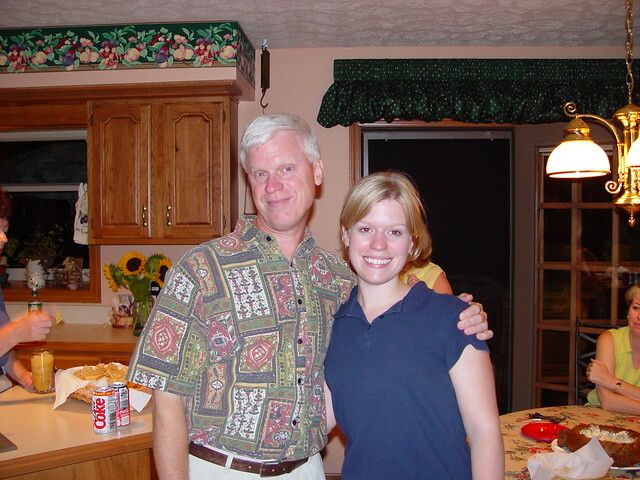 You pour such love into your older homes! 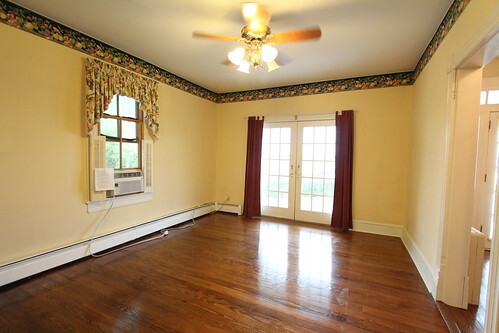 This room will be beautiful whether it ends up being this spring or next! Springtime! Well maybe with all these new tools, you just might do it. What a lot of work ahead! Keep us posted. Can't wait to read and see your progress. 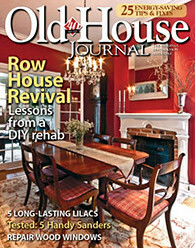 Love your passion for properly fixing up older homes. You’ve found an easy way to remove the border, just remove the entire wall finish! Great post. You seem to do a wonderful work and I believe the results will pay back the effort. Would love to see what's next! Impressive work, and I wish you an easy time of it! Now we wish we could remove the tile/plywood from our kitchen floor and are at a loss. To separate the drywall from your plaster walls did you just come in from the side and use a reciprocating saw to cut through the Liquid Nails? Or had it dried out and become brittle? Do you know of any solvent that will soften the Liquid Nails so we can remove the plywood without tearing out the flooring with it? If anyone has a suggestion we would deeply appreciate it. Un-burrying the original walls and mouldings is SOOOOOOOO satisfying. 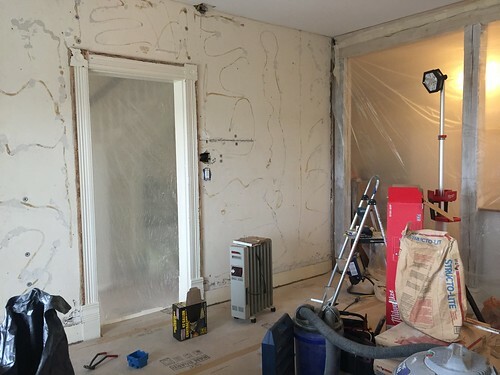 The room will look gorgeous, and luckily it looks like it will need minimal patching. A few dings and holes are just extra character, right?